"In many ways a gulet is like a full service hotel where every room has a sea view and the scenery changes constantly." 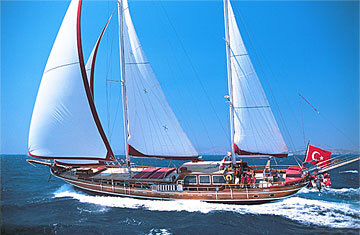 She is the classical Bodrum Gulet, very comfortable and stylish. Air conditioning throughout and as long as you wish. The spacious salon is complete with colour TV and stereo system with CD. Playing cards and a backgammon set are also on board. The fully equipped galley is complete with fridge and freezer, Icemaker. On deck at the stern is a bar area and a large dining table. The boat is a Turkish flagged classical Gulet, and with her lines she is one of the finest boats between Bodrum and Fethiye. Once on board the M/S COBRA QUEEN you will find yourself in an atmosphere of nostalgia which evokes the golden age of world-class sailing ships. The gullet M/S COBRA QUEEN will visit magical ancient sites and coves and you will get to know the most popular bathing resorts and harbour cities. If you want, you can wander through famous archeological sites or use snorkeling equipment to discover sunken harbour moles. is considered to be among the finest in the world. On board the M/S COBRA QUEEN you will find the finest Turkish dishes, prepared using the freshest vegetables, fish and meats. Our cook is an expert in his field. He will pamper you with three meals a day: breakfast, lunch and a three-course dinner in the evening. If you have any special dietary requirements (if there are certain foods you dislike or mustn't eat), simply let him know. He will be able to prepare dishes to suit your exact taste. Meals are mailny served on deck under the awning which protects you from the sun. In cooler months, our guests dine in the deck salon. Your meals on board: Fullboard (3 meals + teatime) price € 38,- p/person per day. Soft Drinks and alcoholic drinks are extra, you may send us a list and we can buy them at supermarket prices and you just pay us the bill plus a service-extra for the crew of only 10%: We think that's a fair offer and all previous guests did appreciate that very much. In Private Gulet Charters, gulet is rented privately. There is no fixed itinerary and it is possible to board or leave the yacht in any harbour, such as Bodrum, Marmaris, Göcek or Fethiye. Prices change depending on the yacht and the month. Large aft deck with comfortable aft traditional deck sofa, dining table and bar combined with wheel house. Cabin top deck for sun-bathing. Settee in front of the cabin top. Four large cabins; three of them arranged as master cabin and the other one arranged as guest cabin with a French bed & a single bed. Suite cabin accommodated forward with dressing room. Hydro-massage & steam bath in each cabin. Spacious saloon with dining area settee and entertainment corner equipped with Plasma TV, DVD Player and Hi-Fi stereo. Lower aft deck accomodation for the Captain and hostesses. Galley and chill box & insulated engine room placed under the saloon. Chain locker and crew quarters in forecastle. And of course, like all our boats, the M/S COBRA QUEEN meets the international safety regulations including life jackets, fire extinguishers and alarms. © pixelwork bodrum 1998-2009. All Rights Reserved.